Summer in Michigan is such a fun season. Strawberries, blueberries, blackberries, raspberries, cherries and peaches are all available, fresh and local, throughout the summer. 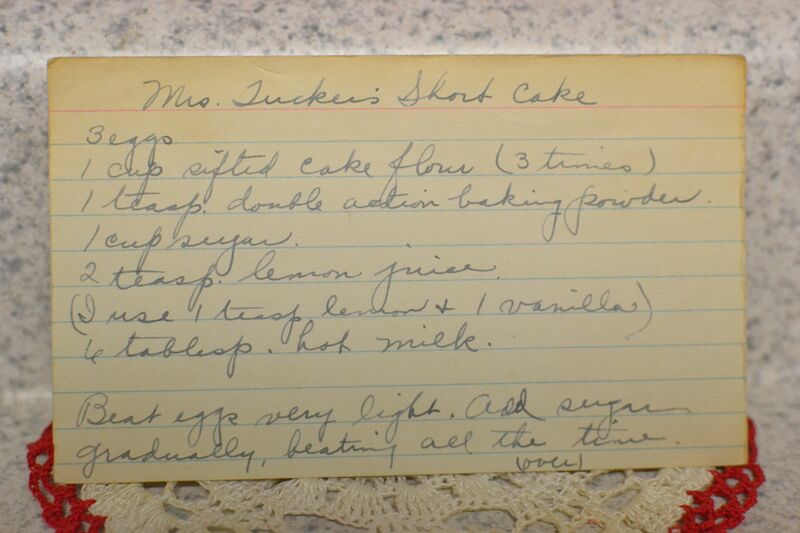 That’s why I quickly nabbed Mrs. Tucker’s Short Cake out of Grandma Dora’s recipe box as soon as I spotted it. It’s the perfect recipe to pair with whatever fresh fruit you have available during the summer months. Beat eggs very light. Add sugar gradually, beating all the time. Add extract. Fold in flour, little at a time. Add hot milk. 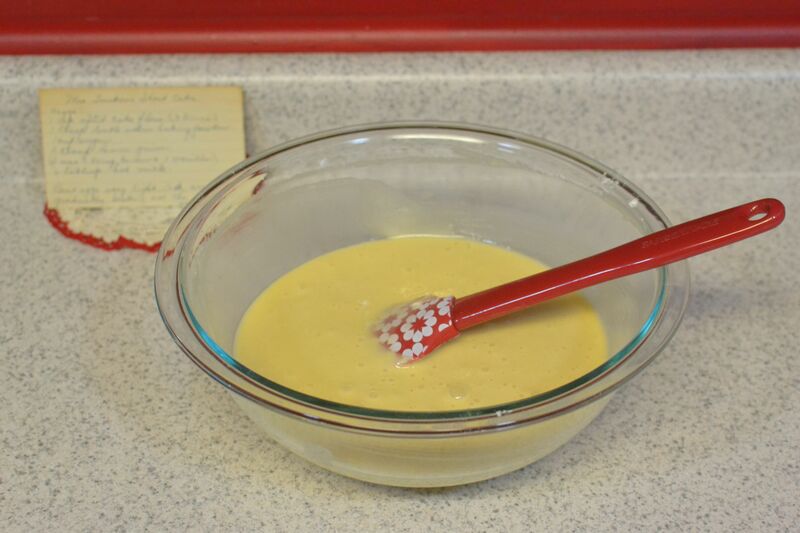 Mix quickly until batter is smooth. the milk in the microwave for 1 minute. Last, I poured in the milk and mixed it in with a rubber spatula. In a small mixing bowl, combine flour and baking powder, set aside. In a medium size mixing bowl, beat eggs lightly. Mix in sugar a little at a time. Stir in lemon juice and vanilla. Slowly fold in flour mixture. Add hot milk. 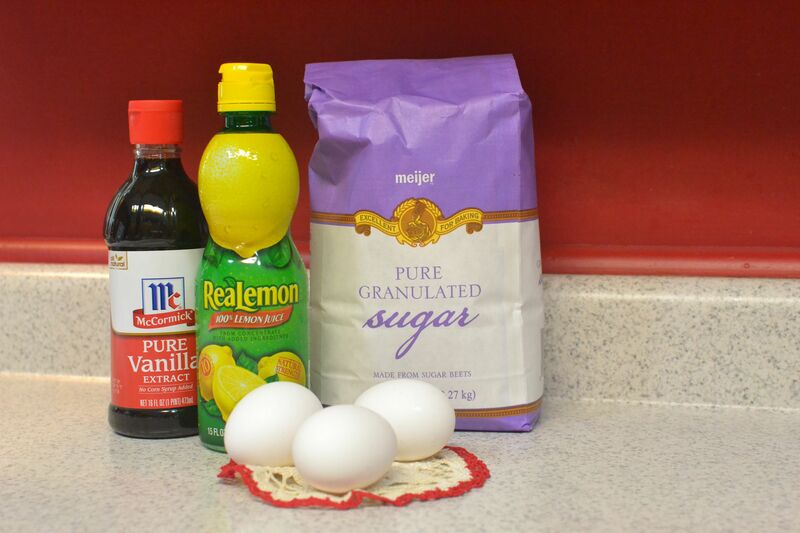 Mix together until batter is smooth. Pour into a greased 8 x 8 pan. Bake at 350 degrees for 25-27 minutes or until a toothpick inserted comes out clean. Cool. Serve with fresh berries and ice cream or cool whip. 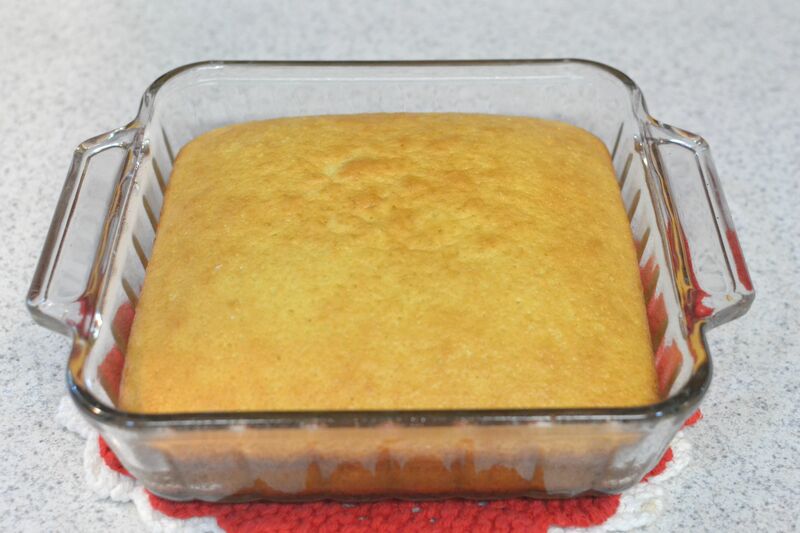 Mrs. Tucker’s Short Cake baked and golden brown. 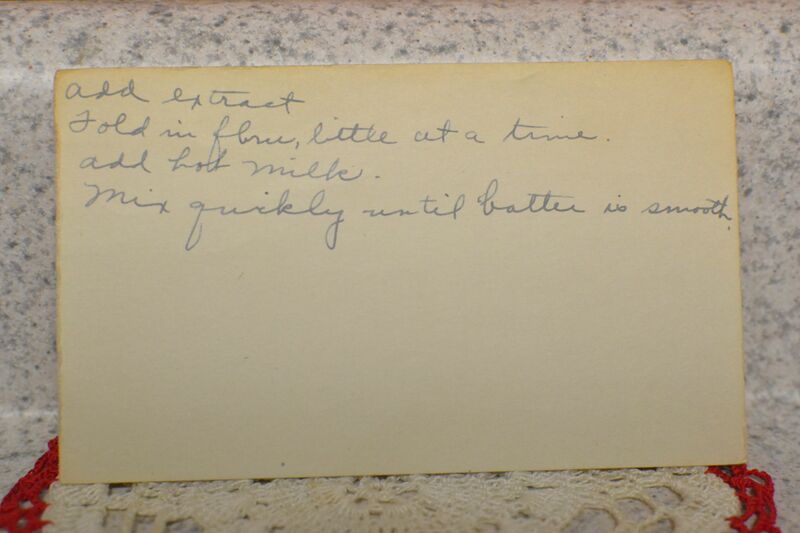 I was eager to try Mrs. Tucker’s Short Cake. Normally, my husband and I aren’t big fans of short cake because it’s usually not very sweet and rather biscuit like. Unless I top it with a lot of ice cream or cool whip I’m not usually interested. But because this batter was so thin, I wondered if it would be more like cake than a biscuit. I knew, that it had to be pretty sweet since it called for a whole cup of sugar. We were both pleasantly surprised when we tasted it! It tasted nothing like traditional short cake. It was sweet and moist. The closest thing we could compare it to was a heavier angel food cake. My husband liked it so much that his was gone before I had finished getting our boys milk to drink with it. This will be our new go-to short cake recipe. No more dry, bitter biscuit “cake” for us! 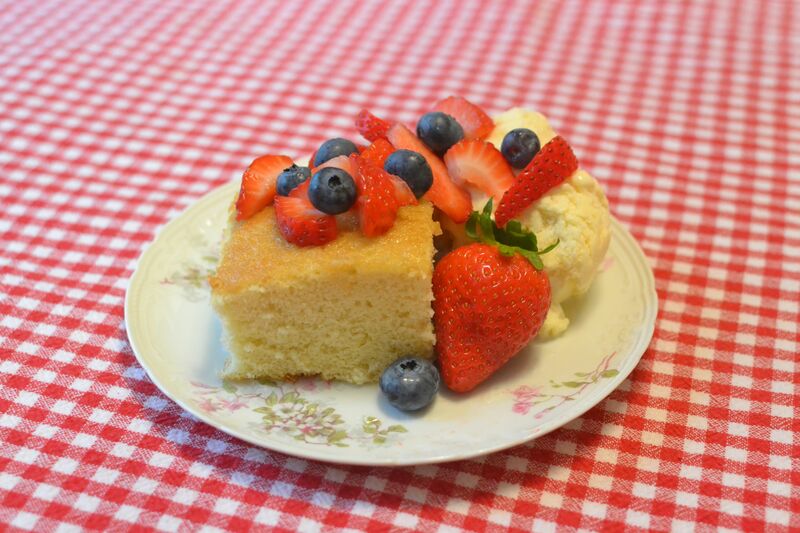 Mrs. Tucker’s Short Cake served with strawberries, blueberries and ice cream! This entry was posted in Cake and tagged blueberries, dessert, farm cooking, fresh fruit, scratch cooking, Short Cake, Strawberry Short Cake, Summer dessert by GrandmothersRecipeBox. Bookmark the permalink. Did she mean sift the cake flour 3 times and did you do this?? Yes, she meant that she sifted the flour three times. Because flour now comes pre-sifted, I skipped this step. Had this for dessert tonight. This is by far the best shortcake I have ever had! Glad you liked it, Matthew! This recipe is a keeper! This is so fun! I think it is an awesome idea and I love how you posted pictures of the original recipe. I will totally be a blog follower! You both write so well too and I love seeing your faces in my mind as I read the entries. Thanks Laurel! Glad you are following along. It’s been fun to learn more stories and recipes as we go along, since we were so little when she passed away.